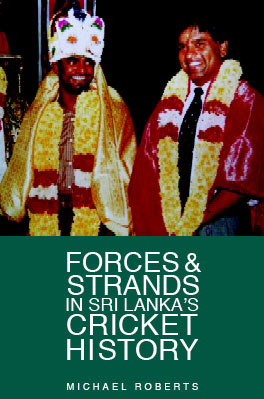 Sri Lankan academic Michael Roberts has issued a booklet charting the key events in the island’s cricketing history. Forces and Strands in Sri Lanka’s Cricket History starts by telling us that cricket is the one game in Sri Lanka that has penetrated the world stage in a consistent fashion. As the national pastime for a large section of the population its purpose is beyond the mere aesthetics of leather on willow. Roberts weaves into this history politics and sociology, leaving his reader not only more enlightened as to the history of cricket on this island, but knowing more about the social forces that have influenced Sri Lanka itself. Cricket was introduced into Ceylon, as the island was formerly called, by an imperial machine that had taken over the island in 1795-6 and later in 1815-18. The first recorded game in 1832 featured members of the armed forces and a gentleman’s club. These class links were maintained through elite educational institutions. Roberts identifies the Malays and the Burghers as the two groups that sustained early cricket within the local population. Both owed their residence to the consequences of imperialism. The Malays had served in the Dutch armies in the eighteenth century, and had become incorporated into the Ceylon Rifle regiment in 1827. The Burghers are believed to have been the descendents of the Portuguese, the Dutch and Europeans serving the Dutch East Indian Company. It was hoped that these communities would be immersed in western values and provide a bridge between east and west. Roberts employs lists throughout to review a range of developments. The key developments between 1948 and 2000, for example, are neatly summarised as six points which take into account Sinhalese broadcasts in the 1960s, the emergence of television, gaining Test status in 1981, the expansion of facilities, widening opportunities and the victory in the World Cup. The island’s greatest cricketing moment is explored in both its sporting and political contexts. The Tamil Tigers detonated a bomb outside the Central Bank on February 4 1996, to coincide with Independence Day celebrations, which for Tamils is a mark of their oppression. This led to Australia and the West Indies forfeiting rather than carrying out their obligations to play their. This in turn distributed the top teams over the final stages of the tournament in a way that favoured Sri Lanka. Roberts then provides another list to provide the cricketing factors that explain why Sri Lanka were victorious, principally the way the batters attacked at the start and the deployment of four spinners to exploit subcontinent conditions. The booklet concludes with a consideration of the forces of social change. Roberts warns of the role of Sinhala nationalism in creating disharmony within Sri Lankan society, which will ultimately affect its cricket. Very few Tamils, with the notable exception of Murali, play first-class cricket. Chief among the nationalist hardliners is former captain, Arjuna Ranatunga, who follows his father as an MP. As a member of the right-wing Patriotic Front, Roberts predicts that Ranatunga is supporting a line that could lead Sri Lanka back into civil war. As a cricket writer Roberts chronicles, analyses and provides insights. His platform is the article and the essay. He suggests in his introduction that an account of the seamier side of cricket politics is beyond the scope of a single historian. I’m not sure I agree. With his passion for the island, and cricket – displayed in this booklet through an array of illuminating photographs – there is only one person to provide the comprehensive history of Sri Lankan cricket. In the space of a year Steve Dolman has produced his first and second books, both excellent, and held down a full time job - we wonder what his secret is?